This project was inspired by a friend of ours who has autism. Because of his disability, he is socially isolated and has trouble communicating online. After witnessing his struggle with social media, we were inspired to make a tool which could help those who feel incapable of expressing themselves digitally. When typing in the Intentions editor, a user can see exactly how they come across in their message. The app includes a simple UX designed specifically for people with autism, and as you type your message, the emojis above the editor jiggle to indicate your emotions. 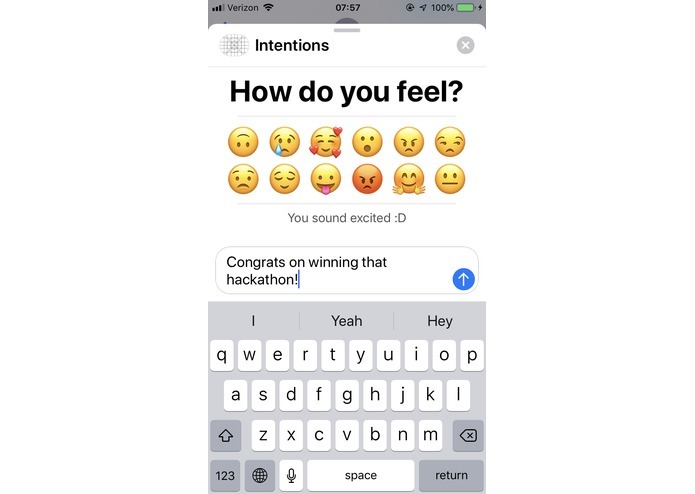 In our original pipeline, we took the user's text so far, put it through text prediction, then ran sentiment analysis on the output to get the predictions that best matched their desired emotion. We then pivoted to a different pipeline which involved analyzing the text as it is written, giving the user updates on how they come across in their message. We used Keras and TensorFlow for the machine learning and Swift for the frontend. After about 12 hours, we realized that although we had built quality machine learning models, there was no time to train them in the cloud. It would have taken at least two hours per model, and packaging them into TensorFlow Lite to be put into the Swift side of things was too much. Throughout the project, we focused entirely on the problem. When designing the UI and UX, the sentiment analysis, and every other aspect of the app, we thought about and researched how we could make it easier and more useful to people with autism. We learned that even if you believe you have a skill down, the fact is that it is easy to be too ambitious. However, if you chase those wild ambitions, you usually end up with something pretty cool. The original idea for Intentions was much more than an iMessage extension. We imagine a full social media platform built entirely for people on the spectrum, focusing on creating an emotionally transparent and supportive environment for kids growing up with autism. We believe that it is everyone's right to participate in social activities and that a lack of social understanding and communication skills is a problem that nobody should have to face. I built the frontend of the application and worked on training some of the LSTMs for the sentiment analysis.